Some of the best ‘art history lessons’ you’ll ever find are these retrospective documentaries (we’ll call them) the Walt Disney studios made of their own animated features. Promotional, self-reverential even, yes — but they open our eyes to the movie achievements that we take for granted (as we do with most of the landmarks of civilization, including technology that we grow up with.) They give us perspective on these entertainments that have been part of childhood for so many millions of people around the world. Rodgers and Hammerstein’s musical Oklahoma, that didn’t hit the footlights until 1943, ‘epitomized the development of the “book musical”, a musical play where the songs and dances are fully integrated into a well-made story with serious dramatic goals that are able to evoke genuine emotions other than laughter,’ Wikipedia reports. But as today’s videos point out, Pinocchio, a ‘fantasy musical’ was doing exactly that, with original Disney studio songs, in 1940. Disney and his team were striving for a unifying musical score and songs that would move the story forward. They turned the Pinocchio character of Carlo Collodi‘s novel from a not very nice adult male character to a mischievous but endearing child with a child’s voice and they developed a central, guiding character, Jiminy Cricket, from a very minor one in the novel, providing their musical’s moral compass. Pinocchio was the first movie I ever saw. My dad took me to see it when I was three old on one its many re-releases. He would later say about that afternoon that he’d never seen my eyes so open wide with awe. Maybe I do remember, a little sitting in that dark theater, completely wonderstruck and certainly feeling many of the film’s emotions. These last two videos of the video focus on the singing, the songs by Leigh Harline and Paul J. Smith, including the Academy Award winning When you Wish Upon a Star that would become the Disney studio anthem, the orchestral score and all of those ingenious background noises — the ‘symphony of sounds’, which was something new in movies then. For a cartoon so bursting with visuals, Pinocchio can be appreciated for the richness of its audio track alone. Interestingly, six songs written for the movie were never used. 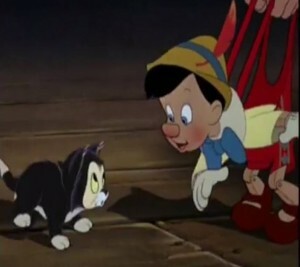 Animation on Pinocchio began in 1938 and wound up costing $2.3 million — twice as much as it cost to make Snow White. It proved to be not nearly as successful at the box office, despite receiving great reviews from the onset. But after 73 years and many re-releases the 88 minute musical has made $84.3 million in theaters and set a standard for hand-drawn animation that some say has never been surpassed. Scroll down to see the previous posts in the Making of Disney’s Pinocchio video series. 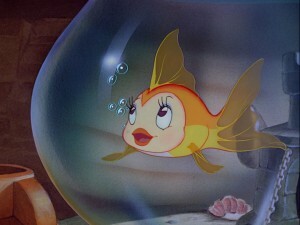 Trivia question – Can you name Geppetto’s pet goldfish? 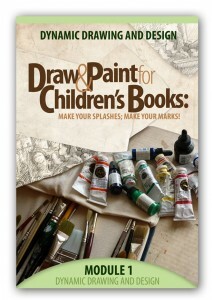 Mark Mitchell, who wrote this post edits the How to be a Children’s Book Illustrator and teaches an online course on children’s book illustration, the Make Your Splashes – Make Your Marks! course. Watch the free replay of the session and Q&A with illustrator Wendy Martin by clicking on the above image.